Spider-Man Inflate-a-Hero (Infinity War) | Nerd Much? Need a hug? Don’t we all from time to time? Well now you can get your fix with this 30 inch Marvel infinity War Spider-Man inflate-a-hero! Maybe you haven’t been able to catch Marvel’s latest release, Avengers: Infinity War, yet, or maybe you have been one of the lucky many who have seen it more than once. Either way, celebrate your Marvel fandom and get your hug on with this officially licensed Spider-Man Inflate-a-Hero. Standing over two feet tall on weighted feet, this super deformed inflatable plush is sure to be the perfect addition to your crime fighting collection. This inflate-a-hero features Spider-Man’s iconic red and navy with gold detailing and the classic Spider-Man decal emblazoned across the chest. Made with a protective hook and loop flap to cover the valve, and a zipper that allows you to remove the inflatable bladder from the plush exterior for easy cleaning. The 100% polyester removable shell is safe for handwashing, or just spot wash as necessary. Standing 30 inches tall and taking about 10 minutes to inflate (manual air pump included), having your own web-slinging super hero to hug has never been more attainable. Short on space? Who isn’t? Luckily, this Spider-Man collectible deflates to be returned to the box for easy storage. 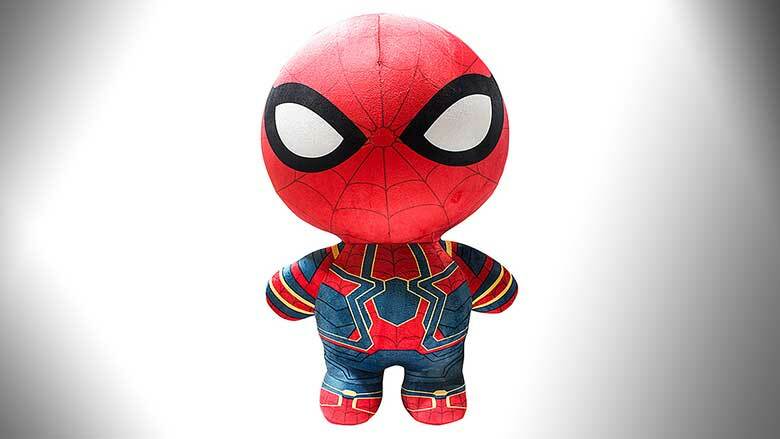 So, save on space while still having this awesome plush hero to break out at your next party, or just the next time you are feeling an extra surge of Spider-Man pride. This Marvel infinity War Spider-Man Inflate-a-hero is currently priced at 29.99 at ThinkGeek and includes the inflatable form, air pump hose, manual air pump and even a repair patch. Can’t get enough Spider-Man in your life? Check out this Officially Licensed Marvel gaming chair, and this Spider-Man built up utility backpack.